Writing a book is hard, but it's impossible unless you finish it. 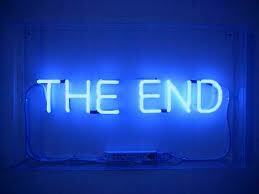 It may sound silly, but you need to get to the end of your manuscript to figure out how to end it. So take a leap of faith and finish that book thats been sitting in a drawer for years. Finish it with ANY ending. What you will discover is you'll soon realize what the real ending should be. But without that temporary one inspiring your imagination, you will never get to the real end. So finish it. Do it. I dare you!